Hudson Travel Mug, 17 oz. This stylish travel mug has the look of a ceramic mug, but is light weight. Minimum order with your imprint, 48. Quantity variation +/- 5% is possible & billable. Setup $50 Exact re-order within last 24 mos. Setup $0 No imprint. No Setup Charge. This 17 oz. 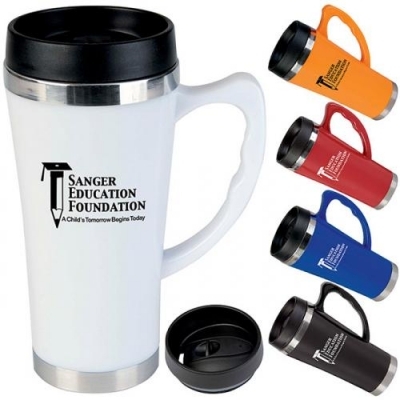 travel mug is a perfect marriage between Acrylic and Stainless Steel. The inner liner is stainless steel for easy maintenance. Included is a leak-resistant slider lid. Materials: Stainless steel, acrylic, and polypropylene. Included in the price is a 1-color imprint, 1 location. Product size: 4-3/4"w x 7-1/8"h, 3-1/4" dia. Available in the colors: Black, Blue, Orange, Red, White. Standard imprint method: Screen Print: Front, 2"w x 2"h, 3 color(s) max. Addititional color: .50(g) per color, 3 colors max. 2 sided and wraparound imprint available with 2 colors max. 3 colors, 1 side only.